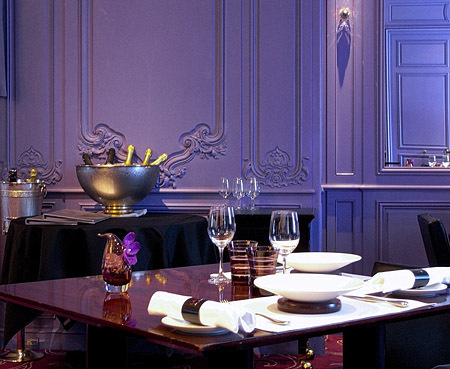 There's fine french dining, and then there's Robuchon's extravagant replica Loire chateau in the heart of Tokyo. It is undeniably luxurious, elegant and beautiful, yes, but yet at the same time, flamboyantly over-the-top because it is in the middle of Tokyo! Maybe it's the Japanese and their meticulous building prowess or more likely it is because it is housing someone of Monsieur Robuchon's stature, the chateau didn't seem at all ridiculous or cheesy, which these types of replicas tend to be in Asia. Inside, there's a bakery in the basement level, a less expensive restaurant on the first floor and two stories of his finest cooking on the second and third levels of the chateau. Dinner for two can cost as much as ¥10,000/US$1100 after drinks and service in the upstairs restaurant. Amazingly, in the first floor restaurant, there is a ¥2950 per person set meal option during lunch. US$30 (give or take, depending on prevailing exchange rate) for a meal at this high temple of fine French dining? I'm there. 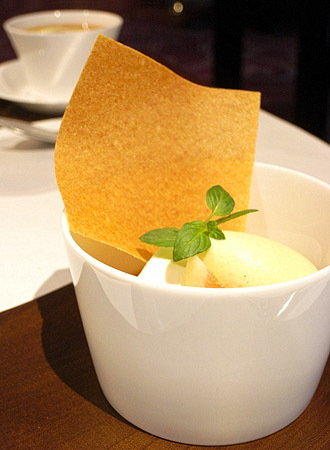 I've loved Robuchon's cooking ever since I had dinner at his Tokyo L'Atelier two years ago. It ranked as one of the best meals I've had, all things considered. So I was curious to see what kind of experience he offers at such a low price point in such a fancy palace. Despite the low entry price point, the dining room is haute French dining through and through. The purple decor gives it a stylish modern touch, but also gives the room a bit of a diva-ish personality. Not quite gaudy, but threatening to become so at any moment. The high ceiling room was airy and quiet, and not even a fifth full when we showed for lunch at 11:30 am without a reservation (it was about half-full when we finished around 1). Seemed like a spot for rich housewives as we saw quite a few tables of them around the rather large dining room (80 person capacity according to their website). 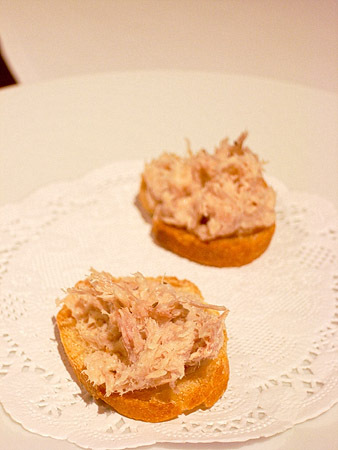 The amuse-bouche was just a couple of tiny toasts with tuna on top. Didn't taste like much, and I've had better hors d'oeuvre from no-name caterers. I suppose this is one place where they're skimping in order to turn a profit on ¥2950 per person. 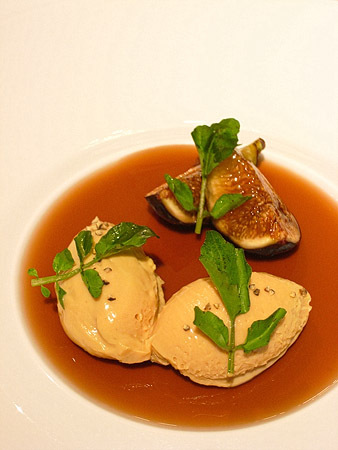 Le foie gras fondant sur une gelee au vin rouge aux figues fraiches. On the menu dejeune (French for lunch menu), there were three options for appetizer and four options for main course. My dining companion and I both picked the foie gras to start the meal (the other opions were a gazpacho and a white asparagus dish). We probably should have done foie gras plus something different to sample more things, but we have no regrets: the foie gras was amazing. The foie gras mousse was crazy smooth and the red wine gelee was all manners of tasty. A great combo. La daurade poêlée avec un bouillon parfumé au jambon. 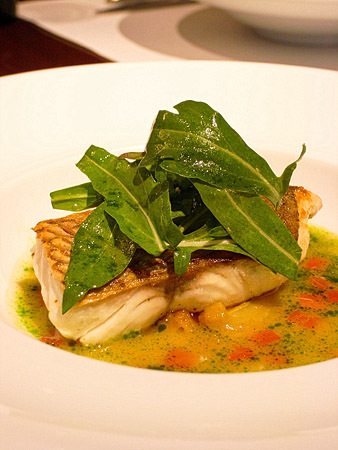 Fried sea bream in ham broth, topped with arugula. Amazing fish dish. Reminiscent of the sea bream I had at his Atelier, except a little less Asian, a little more French in this version. I remember the Atelier one having more of an impact intellectually on top of just being wildly delicious. This was only wildly delicious. El arroz bomba dans un bouillon aux saveurs paella. This was fantastic (as all his dishes tend to be), but I was in a way disappointed because I love paellas and I was looking for something special from the "chef of the century" and this wasn't "special." I'm not entirely convinced this is one of those dishes that works in this type of environment. This is comfort food, and you want a large portion of it all by itself, not a small serving as part of a multi-course meal. A few small bites and the many elements of the paella didn't seem to really mash together coherently enough. He did try to put a twist on the paella by making the chicken with some Japanese flavors but that turned out to be more of a curiosity. That was the end of the lunch set, an amuse followed by an appetizer and a main course. The dessert was a ¥900/US$9.94 supplement. La menthe en gelée avec une crème au citron et ananas mariné. 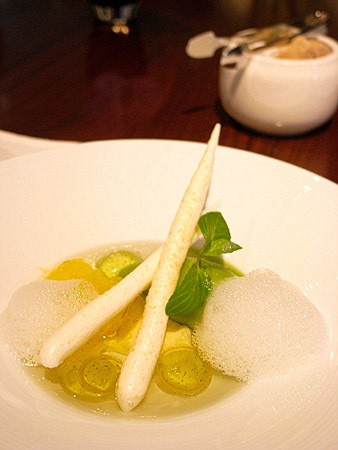 Mint dessert with jelly, lemon foam and marinated pineapples. This is a less sophisticated variation of the dessert I had at Atelier. The one at Atelier was with grapefruit instead of pineapples and the added sophistication came from the sugar stick where at Atelier it a thin tube of hardened sugar containing sorbet (amazing!) and here it was just meringue. La peche en clafoutis avec une glace vanille et figues fraîches. Peach dessert with vanilla ice cream and fresh figs. There were little cubes of peach cake in the bottom of the bowl. Obviously we only tried 3 dishes (let's not count that silly amouse-bouche), so my pronouncements don't really mean a whole lot. 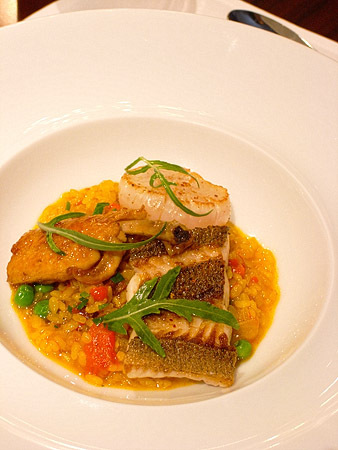 Overall, I find the dishes here have pretty much the same style as his "casual" restaurant, L'Atelier. It's an unbelievable deal for ¥4235 (including the dessert supplement and 10% service), considering you are getting it in a top level fine dining French restaurant, with the accompanying attentive service. Even regular casual restaurants in Tokyo could cost about that much for lunch. But in terms of value, I still think a dinner at L'Atelier is better. For roughly 3 times the cost (¥12600 vs. ¥3850), you get 3 times the dishes and each dish is better. For more pictures, see my "La Table de Joël Robuchon" set on Flickr. Open daily 11:30am-2:00pm and 6-9:30pm.